I have lived in various cities and in various apartments. I have had to purge a lot of stuff along the way. I am a huge reader, so I have found myself donating tons of books. One book that I have not been able to part with, throughout my moves, is a cookbook given to me by a friend. The book is called “Family of the Spirit Cookbook: Recipes and Remembrances from African American Kitchens,” by John PinderHughes. The book is filled with fabulous recipes that I dream about making one day. Besides heartwarming stories of family meal times, the book explores the ways black folks cook food, across different regions. When we think about African-American dishes/soul food, we tend to think about the Deep South. Places like Louisiana or Arkansas. However, this book shows that black folks can also throw down from Kansas to Panama City. The dish I’m sharing, is popular in Maryland. Ingredients: 1 pound lump or backfin crab meat, 1 small onion (finely minced), 2 tablespoons bread crumbs, 1 teaspoon salt, 1 teaspoon freshly ground pepper, 1 teaspoon dry mustard, 1 egg (lightly beaten), 4 tablespoons mayonnaise, flour for dusting, and bacon fat or vegetable oil. Directions: Pick the crab meat, removing all shell and hard pieces but being careful not to break up the crab meat too much. In a bowl mix together the crab meat, minced onion, bread crumbs, salt, pepper, mustard, egg, and mayonnaise. Fold lightly in your hand,making sure not to compress the cake too much. 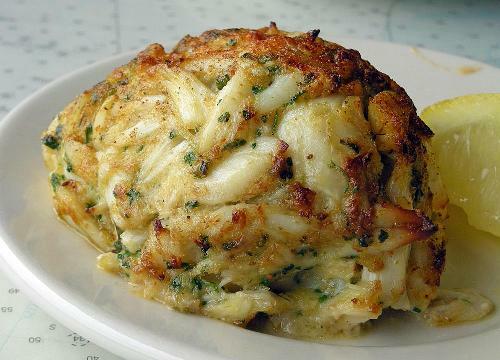 The crab cake should just hold together. Sprinkle with flour and fry slowly in back fat or light vegetable oil until golden brown (pg. 51).